Drift Boats "Go with the Flow"
Being a fishing guide is about as good as it gets, I think. Especially if you enjoy meeting new people, looking after them, and making sure they get to have a great holiday. It probably helps if you like fishing too, I�m sure! And of course, boats are a key element in many fishing guide�s services, but mainly for trolling, or for gaining access to good beaches and stream mouths, etc. A New Zealand Story about drift boats. As part of expanding our guiding services, we felt it was important to be able to put all clients into good portions of our rivers. Some guides use jet boats, noisy damned things that just don�t fit that well with the relaxed and soothing pace more in keeping with fly fishing a remote stretch of river. As a research tool, the Internet is superb. We were very interested in assessing the level of service, transportation, accommodation etc provided by our fellow guides in the US. A by-product of that research was the discovery of this fascinating concept, floating down river while fly fishing! We�ve always had boats. Years ago, we regularly ran white-water rivers in a 10ft aluminium dinghy, hunting and packing out deer. 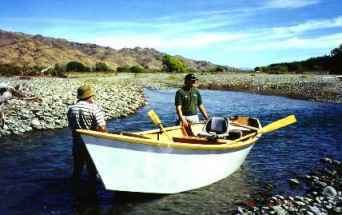 The problem is, all the boats available here in New Zealand are just not that well suited to fly fishing our rivers. In general, New Zealand fishermen tend to be of the "walk & wade" variety, boots and shorts the normal attire. Well, the water is warmer, and waders are uncomfortable on long hot days�. As for drift boats, not too many people have ever even heard of them! Well, we did some homework, and acquired a couple of books and videos written and produced by US guides. We quickly decided that this type of boating had a definite application here in New Zealand, and just as quickly discovered that we could not buy one here! Ever heard the term "Kiwi ingenuity?" Well, over here, if you can�t buy it, or if its too expensive, you either make it out of something else, or build it from scratch! 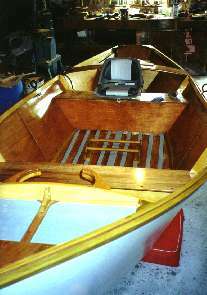 The Internet quickly provided several sources of plans, and we settled on one called the "Drifter" from Glen-L Marine Designs, 9152 Rosecrans Ave, Bellflower, CA 90706-2138, USA. These guys have a comprehensive Web site, with on-line ordering available, and delivery to NZ was very efficient. My friend of 30 years, Ron Beardsley (age 73), had built several Hartley-plan runabouts previously. The plans duly arrived in late December, and Ron�s well equipped workshop provided the most appropriate construction venue. This was a fascinating project for me, not having built a boat before. 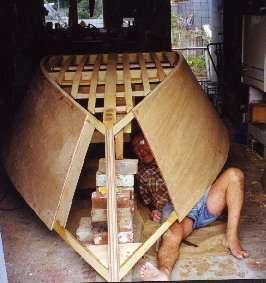 It was a while since the garage had been used for a boat-building project, so Ron had to have a big clean-out. Well, more of a re-shuffle, really, as he is not noted for disposing of anything even remotely useful. The full size plans are excellent. We experienced some difficulties understanding some of the US terminology, but once we sorted out the confusion between forms and frames, sheer clamps and gunwales etc, it got easier. 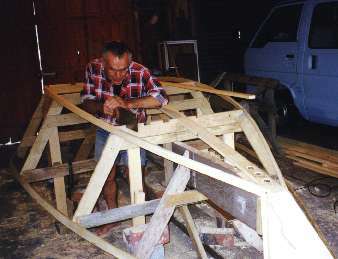 The construction set-up was completely different to any previous construction we had been involved in, the rigid form over which the boat was built was new concept to us. Meticulous construction of the building form was time-consuming, but essential. 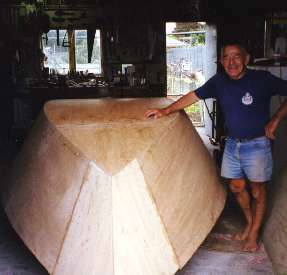 This boat design does not have internal frames, and the set-up geometry is interesting, to say the least. The US dimensions are Imperial - feet and inches - no problem to us older blokes, who are still trying to adjust to the change to metric, some decades on. However, we soon discovered that two 8x4 foot sheets must be longer than two 1.2m x 2.4m sheets - necessitating an unexpected extra join on the sides! The plans and instructions were in the main good, but a couple of points stand out now that we have finished. The design calls for a 4x1in keel, and 3 so-called "floating" floor battens on either side of the keel. 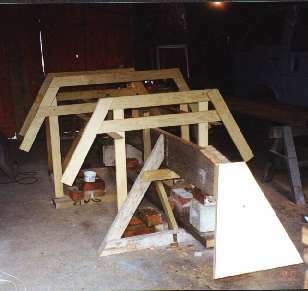 The floor battens were to be fitted into notches on the forms prior to placing the bottom planking on. 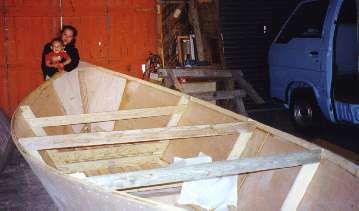 Then, the instructions stated that the floor battens were to be attached after the boat was completed. This still puzzles us! We screwed and glued the planking to both the keel and floor battens at the same time. Frankly these floor battens are a pain in the proverbial � in hindsight, using heavier ply on the bottom would have been a much better option. The main challenge is in removing any water from between the battens, and they are not great to walk on either. Fore and aft we�ve covered them with floorboards and non-skid matting. In the centre they must be left exposed, to facilitate bailing. Turning the boat over to fit the interior was a challenge, as was turning it back to glass the bottom! We recommend to you our solution � get help! Ron�s friend is the local fire chief, we asked nicely and he dispatched a team of lads in uniform to assist in rolling it over! Pretty good service, huh? We have stuck closely to the plans in terms of structure, but have added numerous functional embellishments to suit the use we will put the boat to. We found a number of builders of beautiful drift boats on the Internet. Our approach was to print off all the examples of the great western drift boats used, for example in Montana, on all the good sites as we found them. Every day throughout the building project we�d read through the folder at coffee times. Numerous debates on obvious good features saw modifications to the original plans. 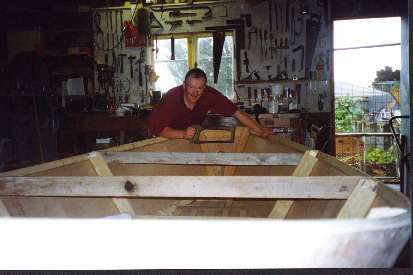 As an example, the plan called for a top deck, we turned that into a casting tray as per Montana Boat Builders examples. Also added were the front knee locks, and the nifty arch supporting the rear knee locks. Posting a web site link to the Montana boat-builder whose work we admired resulted in the boat-builder, Jason Cajune, finding our web site and making contact via e-mail. This project has made us several new friends in this way, from all around the world. Not only that, but we have learned a hell of a lot in the process. 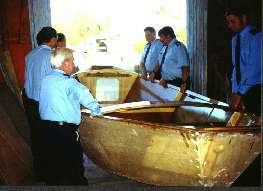 We are already planning our next boat, and will use the "stitch�n glue" technique commended to us by Jason Cajune of Montana Boat Builders. 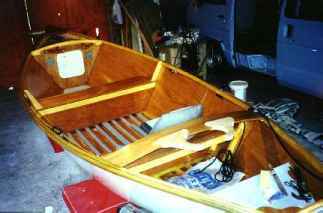 A copy of his 15 foot light-weight guide boat is our next project, we want to built it over the next few months of winter. With luck, his plans to visit NZ and maybe go fishing with us will eventuate, and we can pick his brains in person! 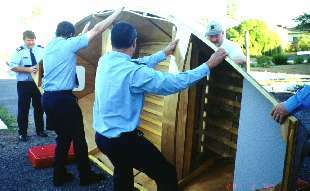 The most difficult aspect of the whole project was the construction of the boat trailer! What a mission that was. No shortage of manufacturers around, but all were reluctant to give a firm price on this odd-ball job. Finally, the guys at a local car trailer company agreed to build it, based on a design they have for aluminium dinghies. We gave them some photos of the excellent Clack Craft trailers, plus the original boat plans with all the dimensions etc. Remember, these were full-size plans�.. Well, the guy rings up and says "Come and get it." When I arrived to pick it up, I had that sinking feeling as soon as I saw it! Somehow, the bottom width of 48 inches had got translated into "48 inches between the mudguards." The bloody thing was 19 inches to narrow, what a disaster! So, they had to rebuild it, re-galvanise it, etc. But now that its all finished, we are quite happy with it, and will get them to build the next one � maybe that one will show a profit for them! The boss said, "When will I ever learn about one-off manufacturing jobs? If I�d given you $500 when you first came in, and told you to buzz off, I�d be much better off." The first voyage of the boat was a great day out. Choice of venue was the Hurunui River, about an hour north of Christchurch. The trip down from the Hurunui pub to the State Highway One bridge took most of the day. The first section is wide, braided and gravel, with multiple streams splitting and reforming. This is followed by a long gorge, mellow and easily navigable, with a couple of minor rapids, a tree hazard or two, occasional mid-stream rocks and several shallow shingle fans. There were no mishaps and a couple of trout. These were caught on spinning gear - for the keenest fly fisherman on board, this was a little disappointing. Not due to any lack of skill on my part, I hasten to add, but I had to row the boat! The boat performed flawlessly, and greatly exceeded our expectations. It looks great, is roomy and comfortable, and very stable. The knee locks, plans of which were created by "eye-ometer," worked out great and give an encouraging degree of support. With four big men on board, and one 10 year old daughter plus gear, it was heavily loaded. Still, it only drew 4-5 inches of water, and we only touched bottom a couple of times on some shallow fans. Manoeuvrability was impressive, aside from the load weight factor, and we managed to miss all of the obstacles Mother Nature had placed in our way. The most enjoyable thing about ownership of this boat is the degree of interest it arouses. It is so unusual, especially with the internal configuration of knee locks etc, that people are really intrigued by it. The hull is radical by NZ standards, and really stands out at the launching ramp! All in all, its been great fun building and using it, and we look forward to years of enjoyment from it. Our guiding development plans call for having drift boats based on both sides of the South Island, ready to serve clients at a couple of hours notice. So, building another one starts soon, and we can all look forward to traces of two-pot glue on our trouser legs for a few months to come, I think.